Function：Machine for fiber bale opening fiber opening and pillow filling. 1. 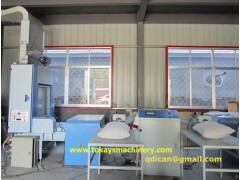 Automatic pillow making machine used for fiber bale opening, fiber opening and pillow filling. 2. Equipment: Bale breaking machine, blower, feeding hopper and fiber opening machine, double nozzles pillow blowing device with auto clamp, PLC control box. 3. only need 1 labor for pillow case changing, save labor cost. 4. High efficiency 6-10pcs /min. 5. Electricity key parts adopt world famous brand, such as Omron, Siemens, Weidmuller etc. Stable and easy to get local support. 6. Main structure of machine made by computerized laser cutting machine. 8. Please let me know your pillow size and requirement for capacity.